The Baugher Initiative was inspired by former Marine Corps SSgt and current JDog franchise owner, Rob Baugher and family with support from the JDog Foundation, in honoring the men who fought and served alongside him but would never come home. We want to honor their selflessness, dedication and ultimate sacrifice by carrying on their strength, character and stories, along with all the post 9/11 fallen heroes. This will be achieved by gifting a special personalized dog tag with the name of one fallen hero. For every post 9/11 Dog Tag name created and given to an individual contributor, with a contribution of a $50 or more, a duplicate tag will be added to a monument at the JDog Headquarters for all to see. 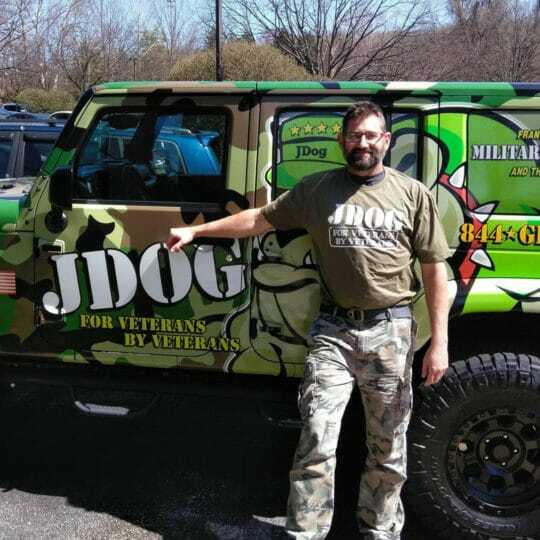 The initiative will allow the JDog Foundation to give back to various Veteran programs and inspire us and our communities to live the best lives we can by honoring their bravery and sacrifice.